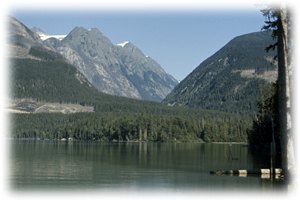 Kitsumkalum Provincial Park is a small park with a user maintained camp ground. It is an old Forest Service recreation site and is easily accessed by road. There is room for up to seven small camping parties. Fire rings and a pit toilet are the only facilities provided in this park. The lake is easily accessed from the campground and offers some excellent paddling opportunities. The sandy shoreline hugs the lake to the west of the campground and is a great beach for swimming. There are no developed trails in this park. It is possible to launch small boats by hand from one section of the beach. Driving or backing trailers onto the beach is not recommended. The park is located about 25 km north of the city of Terrace. To access the park, drive north on the Nisga’a highway #113 towards the town of Rosswood, then turn left on the gravel road just past Goat Creek. There is only a BC Parks Boundary sign marking the entrance. A short drive down this road will bring you to the lake and campground. Wildlife: Like many of the parks in this area, Kitsumkalum Park offers some great wildlife viewing opportunities. Black and grizzly bears, moose and eagles are commonly seen around the park. Paddling along the shores of Kitsumkalum Lake is an excellent way to view some of these creatures. Kitsumkalum Lake offers some excellent canoeing and kayaking opportunities. The lake is easily accessed from the campground. A paddle along the lakes shoreline can produce scenic views and wildlife viewing opportunities. Boats can be easily put in the lake from the beach. Kitsumkalum Lake offers some good seasonal fishing for Coho salmon, Dolly Varden char and Cutthroat trout. Anyone fishing or angling in British Columbia must have an appropriate licence. Please consult the BC Freshwater Fishing Regulations Synopsis and Freshwater Salmon Supplement for seasons and limits, or go to http://gofishbc.com for more information. Pets/domestic animals must be on a leash at all times and are not allowed in beach areas or park buildings. You are responsible for their behaviour and must dispose of their excrement. Please look after your pets and clean up after them. Please respect the privacy of others and keep your pet nearby to prevent disturbing others. The lake offers some excellent swimming from its sandy shoreline. There is no designated swimming area and no lifeguard on duty. Windsurfing can be done on Kitsumkalum Lake. Windsurfers can access the lake from the beach. The lake can be cold so be prepared. There is no firewood available in the park so it is recommended that you bring your own. The cutting of trees in the park is prohibited. Limited burning hours may be in effect at some parks and fire bans may be implemented during extremely hot weather conditions. Be prepared to bring a portable stove for cooking. There are no picnic tables or shelters in the park, however it is only a short drive off the highway and is quite a nice spot for a picnic. The campground runs on a first come, first serve basis and does not accept reservations. There is room for up to 7 smaller groups on the unmarked sites. This campground is more suited for tents and small campers. Larger recreational vehicles or vehicles towing large trailers may find it difficult to manoeuvre, especially if the park is crowded. There is a general store 10 minutes north of the park in the town of Rosswood. No firewood is provided and the cutting of trees in the park is prohibited, so it is recommended that you bring your own. Fire rings and a pit toilet are the only facilities provided. This campground is user maintained so please respect it and pack out any garbage that you may produce.